Located in Summit, New Jersey, the law firm of Russo Tumulty Nester Thompson & Kelly, LLP, offers comprehensive legal representation in a variety of practice areas in order to meet the needs and demands of a diverse client base throughout Union County and beyond. Personable and responsive, the firm's attorneys will partner with you in order to deliver the highest level of counsel and support possible to your company. Recognized for their impeccable professionalism and exceptional legal service, they have earned numerous awards and honors throughout their careers, including AV Preeminent peer-review ratings* through Martindale-Hubbell, so you can trust your case will be in the most capable hands possible. 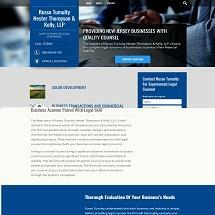 To find out more about how the legal professionals at Russo Tumulty Nester Thompson & Kelly, LLP, can best serve you and your business, you can contact their Summit law office to schedule a free initial consultation.